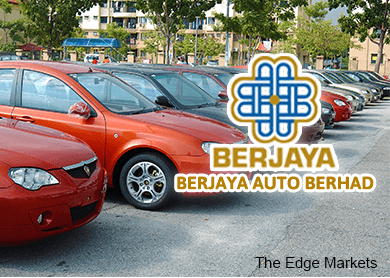 KUALA LUMPUR (June 11): Berjaya Auto Bhd saw its net profit for the fourth quarter ended April 30, 2015 (4QFY15) rise 14.9% to RM55.26 million or 6.8 sen a share from RM48.1 million or 3.5 sen a share in the previous year, on higher revenue. Revenue for the quarter was at RM424.34 million, up 7.4% from RM394.98 million in 4QFY14, its filing to Bursa Malaysia today showed. The automotive distributor has recommended a fourth single-tier interim dividend of 2.75 sen, and a special single-tier dividend of 3.25 sen in respect of FY15, both of which are payable on July 22, 2015. This brings the group's total dividend declared for FY15 to 14.60 sen against 5.25 sen last year. In a filing with Bursa Malaysia today, Berjaya Auto (fundamental: N/A; valuation: N/A) said the implementation of the goods and services tax (GST) on April 1 has affected the sales volume growth and gross profit margin of Mazda vehicles. Despite this, the group said both local and overseas operations continued to record double-digit growth in sales volume of Mazda vehicles, with the lower priced new Mazda 2 contributing significantly to volume growth. For the full year, its net profit stood at RM215.41 million or 26.6 sen per share, up 64.9% from RM130.62 million or 17.21 sen per share in FY14. Revenue grew 26.2% to RM1.83 billion from RM1.45 billion on higher sales volume of Mazda vehicles. Going forward, Berjaya Auto expects its performance for FY16 to be challenging due to the implementation of GST, which has weakened consumer sentiment, and anticipates heightened competition due to an inventory overhang from excess production capacity. "The expected growth in the local Total Industry Volume, which did not materialise in the first four months of sales in 2015, will lead to a further overstocking position," it added. In the short term, Berjaya Auto expects the sales volume of Mazda vehicles in Malaysia to be impacted by heavy discount promotions by competitors and motor vehicle gross profit margin will be compressed. "Notwithstanding the aforesaid, the group may be able to mitigate these challenges with better contributions from its Philippine subsidiary and associated companies in Malaysia and also new model launches planned for the second half of the current financial year," it added. Shares in Berjaya Auto closed unchanged at RM3.55 today, for a market capitalisation of RM2.9 billion.